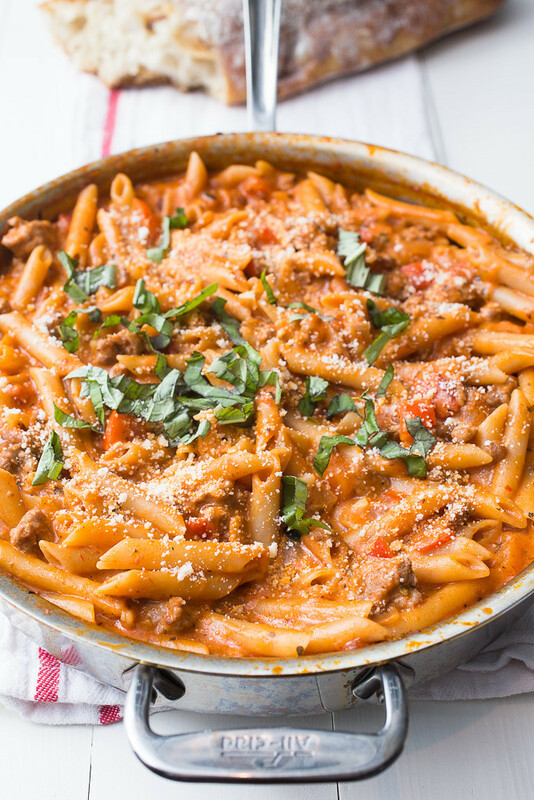 One-Pot Creamy Sausage Pasta – an irresistible and super simple one-pot pasta dish filled with spicy sausage and a silky tomato cream sauce. I promise I’m not going to talk about snow this week. Except, I’ll say that I’m happy now since OMW (Old Man Winter) certainly delivered us a bunch of the white stuff the other day. Instead, let’s chat about this pasta, ok? 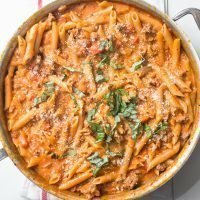 This one-pot creamy sausage pasta recipe. Because it’s nothing short of outstanding!! It’s one of those one-pot meals where you start out wondering how the heck the pasta could every possibly cook in a pool of majorly diluted marinara sauce and then you end up licking the bowl clean. Not even kidding! I’ve been making and tweaking this dish over the past year – more times than I can count – and it’s FINALLY ready for you to dive into. Because really, that’s exactly what we do when it’s finished cooking! And let’s just say that I’ve taken this pasta down a few different paths in my many iterations this past year and I can say with certainty that it’s fairly versatile. 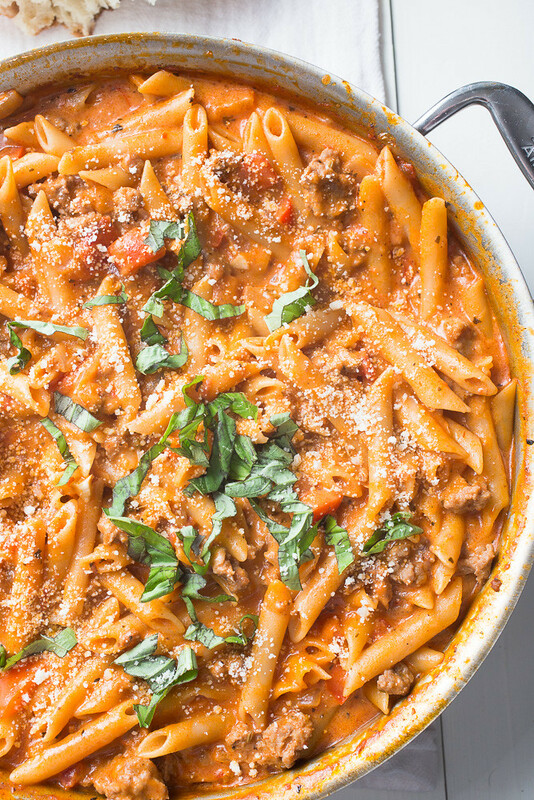 Make this One-Pot Creamy Sausage Pasta Recipe Your Own! Ground sausage and fresh chicken sausage work equally well. I usually use a jar of Trader Joe’s marinara sauce – of course, any marinara will do – but I have also used crushed tomatoes mixed with an Italian herb blend when I’m out of the jarred stuff. Half-and-half or Greek yogurt can easily replace the heavy cream. I’ve replaced the wine with some chicken broth as well without too much consequence to the dish. And I’ve used red wine in place of white wine when that’s all that was left in the house. Adding some fresh greens like spinach, kale, or chard not only adds a whole lot of color, but they boost the nutritional factor as well! And if you’re wondering about how a diluted marinara sauce could possibly ever work to cook pasta and still be good, there’s no need to worry. I got a major side-eye from Kyle about this too as I made it the first time. But it so so works! The sauce-water mixture boils down in a large, wide, skillet to this silky sauce that nestles into the pasta hollows and perfectly coats the nooks and crannies of whatever short pasta shape you choose to use. You’ll see regular penne in these photos but I’ve also made this recipe with rotini, mini rigs, and cellentani and we love all of these shapes equally! The cream and Parmesan cheese add quite a bit of richness to the dish and a good sprinkle of hot pepper flakes brings it all together. 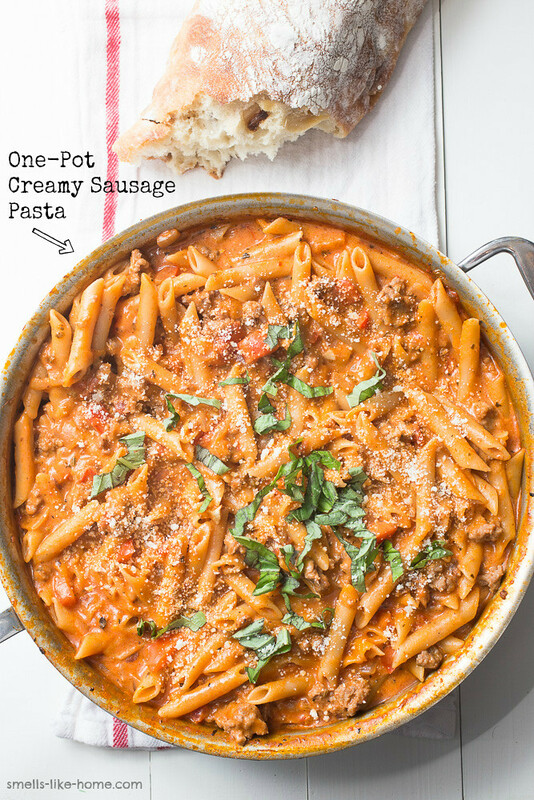 In my world, you can never go wrong with a one-pot meal and this one-pot creamy sausage pasta just completely rocks our dinner world. Odds, are it’ll rock yours too! This recipe is a Buzzfeed favorite! →→→ Take me to Buzzfeed! See what the Pinterest world is saying about this recipe! →→→ Take me to Pinterest! 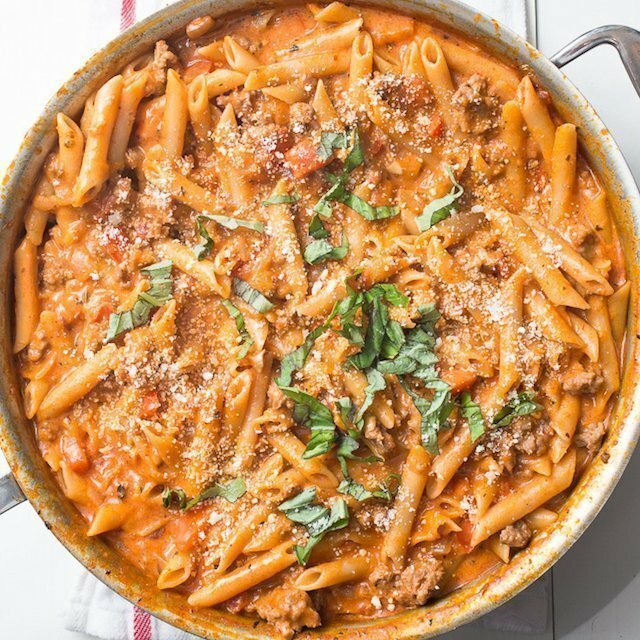 An irresistible and super simple one-pot pasta dish filled with spicy sausage and a silky tomato cream sauce. It's a perfect family-friendly meal for busy weeknights! Heat the oil in a large skillet over medium-high heat and saute the peppers and onions until they start to soften, about 8 minutes. Stir in the garlic, fennel, red pepper flakes, and a good pinch of salt and a few cranks of black pepper. Crumble the sausage into the skillet and cook with the peppers and onions until browned. Pour the wine into the skillet and scrape up the bits on the bottom of the pan. Pour the sauce and 3 cups of water into the skillet and then stir the pasta into the mixture until well-combined. Bring the liquid to a boil, reduce the heat to medium-low, and cover. Allow the liquid to simmer, stirring occasionally at first and more frequently towards the end to prevent the pasta from sticking, for about 15 to 17 minutes. Every 5 minutes or so, stir in a little of the remaining cup of water. If the liquid starts boiling over, reduce the heat to low. When the pasta is cooked through, stir in the cream, Parmesan cheese, and most of the basil (reserving a little for garnish). Allow the cream to heat through for 2 minutes. Season with salt and pepper to taste. Allow the dish to cool for 5 minutes, sprinkle the remaining basil over the top, and serve. Replace sausage with ground pork, turkey, or fresh chicken sausage or even vegan sausage! Any type of marinara will work but I have also used crushed tomatoes with an Italian herb mix when I'm out of the jarred stuff. Replace wine with some chicken broth - or replace the white wine with red wine. Add some fresh greens like spinach, kale, or chard which not only adds a whole lot of color, but they boost the nutritional factor as well.